I have been making my pro header and footer but they don't respond well to different screen sizes. Have I been using the header and footer. I suggest that you check this article for more information and how the responsive system works in the Pro header builder. For example, if you use the Navigation Inline element for a menu it will not change to the mobile menu and you need to use the Navigation Collapse element. But you have a cool tool at your hand that you can hide/show different elements for different browser sizes. For more information please read this article. If you have a more specific question we will be happy to get the screenshots and specific case to help. Hey could you take a look into the way I built my header /footer and see if I need to change them to make them responsive? 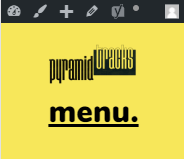 I currently don't see a menu in your site because you've set your bar to absolute position. I've set it to relative and checked the view on mobile and I see this. The fix would be to set the Self Flex option of the containers containing your logo and menu to Standard. Then, set your Bar's height to auto. Last is set your Image's and Menu Toggle's margins to 0. It would be beneficial that you learn in our Knowledge Base first in order for you to know what the options will do. For this particular case, I'd like to point you to Element Resources section of our KB.